Brides can find inexpensive yet elegant bridesmaid gifts to thank the women sharing their big day. Wedding party gift purchases can add up quickly, but they need not be a budget buster. Follow a few simple tips and suggestions to find classy but cheap bridesmaid gifts. Thanking the people who have stood by you as you plan your wedding is something you do not want to forget. Whether you have a huge bridal party or simply a small budget, you can find the perfect gift for your bridesmaids without spending a small fortune. What will help my bridesmaids keep their wedding expenses down? Purchasing costume or fashion jewelry for the wedding, such as earrings or a necklace, is often inexpensive and helpful to the bridesmaids. 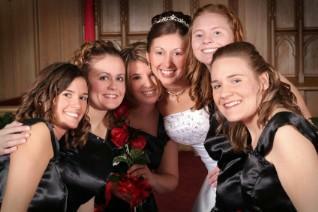 Are there any favorite hobbies my bridesmaids have? Just because they are all in your wedding does not mean all the bridesmaids would like the same gift. It's perfectly fine to pick out a gift that is geared towards each girl's interests. Can we get a gender-neutral gift for both the bridesmaids and groomsmen? Buying bridal party gifts in bulk amount often results in a lower price for items like key chains or wine goblets. Keep an eye out for a sale or coupons that you can combine with a sale for the best price. Look both online and in stores before you purchase. Just because the gift is a thank-you gift does not mean it has to be purchased at full price. Couples who are planning a wedding over six months or a year have time on their side. Instead of having to purchase the first items they find, they can look for the best deals available. One way to find inexpensive gifts for bridesmaids is to consider picking up items at beginning or end of season sales. Create a wedding party gift basket for your bridesmaids. Put in toiletries they will need on the big day or pampering items for after the wedding. You could put in snacks and drinks, too. Bridesmaids may appreciate getting a gift certificate to an area dry cleaners for getting their bridesmaid dress cleaned after the wedding. Practical gifts like this often go over well with bridesmaids who would not appreciate trinkets or jewelry. Making homemade bridesmaid gifts will require some forethought. The more difficult the project, the earlier you will need to begin making the gifts. Use supplies you all ready have on hand and supplement with items you purchase on sale or at a discount. As with any thank you, the bridesmaid gift is one that means the most when it comes from the heart. Whether you spend a fortune or just pennies, the gift should always include a note that expresses how happy you are that the woman is in your wedding party. That means more than the price tag of any bridesmaid gift.